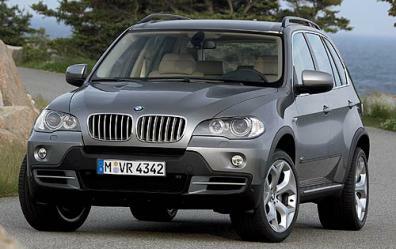 Although no longer so new, the BMW X5 4.4i is master of the rough and king of the smooth. With its all wheel drive system the vehicle knows how to take care of you in every situation, and it does this in a fashion that is both comfortable and very dependable. Whether you tackle the long road home or hit the town at night, you will be doing it in a heck of a lot style. The BMW X5 4.4i will not disappoint you. Equipped with a 4.4 litre V-8 engine that is linked to a 5-speed automatic (the same set up that is in the BMW 540i and 740i), the car is perfectly set up to bring a nice blend of power, control and handling. You will have no problems using your BMW X5 4.4i to tow a trailer or caravan anywhere – that’s for sure! The interior of the BMW X5 4.4i is designed for lots of comfort for those long trips. It has many features like power adjustable heated driver and passenger seats, a sun roof, cruise control, a premium audio system boasting a CD changer, power windows, central locking, electric mirrors, plenty of storage pockets and space located throughout the vehicle, air conditioning with climate control, a tilt adjustable steering wheel, intermittent wipers and a whole host of other options and features. Safety of course is number one with BMW, and it shows with the BMW X5 4.4i. The superb Dynamic Stability Control system helps keep you on the road. ABS Anti-lock brakes, driver and passenger front and side airbags, Hill Decent Control, an alarm system and many other safety features help keep BMW right at the forefront of automotive safety. Take a BMW X5 4.4i for a test drive today. Feel how comfortable and dynamic the ride is and experience how quickly you will see that owning a BMW X5 4.4i is the only way to go. For any more information on the BMW X5 4.4i, or for that matter any other new car, contact one of our friendly consultants on 1300 303 181. If you’d like some fleet discount pricing (yes even for private buyers! ), we can submit vehicle quote requests out to our national network of BMW dealers and come back with pricing within 24 hours. Private Fleet – car buying made easy!